I appreciate you can make your own “luck” – being in the right place at the right time can be as simple as knowing who or what is coming to town, then being ready for it. That’s not to say that reportage (the capturing of ‘news’ or a occurrence of some kind) cannot be ad-hoc. But if you know what’s going on, then you can be ready for it, there in the correct spot, with the correct equipment that you anticipate using. Or at least that’s the theory! In 2015 I was staying at my parents house, feeling a little bored I decided to go a park that I used to go to as a kid.. ..I got there to find a huge section of the park cordoned off, and guarded by the police. Judging by the small handful of public people milling about, whatever was happening, wasn’t a publicised event! The clue was in the middle of the cordoned off section… A helicopter! 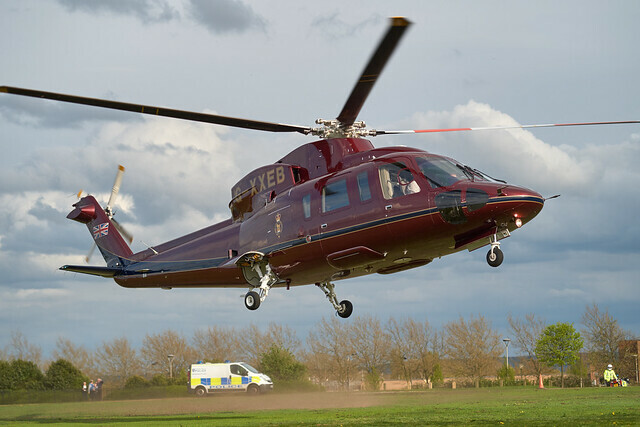 A royal helicopter no less! I asked the nearest policeman what was happening, and he explained that princess Ann was attending a ruby match, and this was the point that her helicopter was waiting for her. Now of course had I known I would of been here at that moment, for sure 100% I would of bought a telephoto lens with me! But it was what it was, and I wasn’t going to let a lack of zoom stop me from trying! About that…. Let’s just say you’re not seeing any pictures of a genuine royal princess here! It reminds me, that it’s nice to be a little bit lucky, but it’s awesome if you can be properly prepared. Of course you could just take all of your camera gear with you, every where, every time.